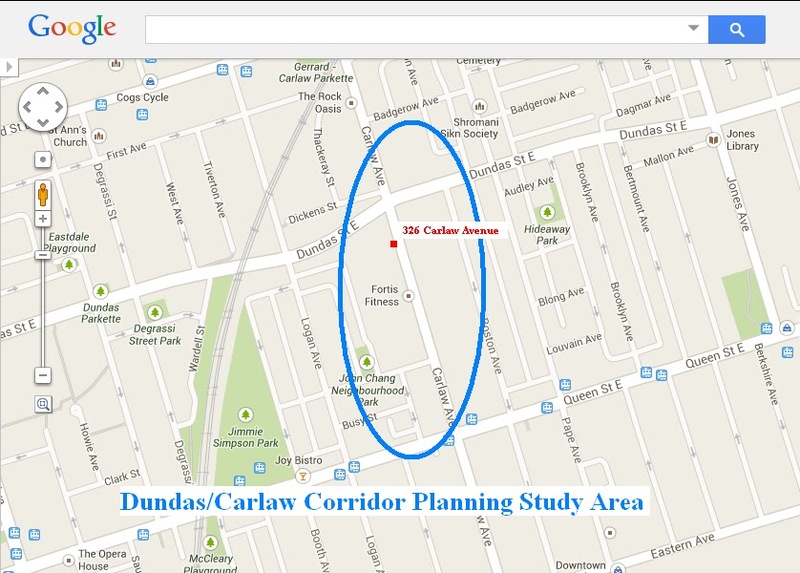 There was lots of ‘Bike Amenities’ talk at last nights’ initial “Dundas/Carlaw Corridor Study” Public Consultation. The meeting was held at 326 Carlaw Avenue in the buildings’ 3rd floor Amenity Room – a spacious, open room which looks out through three floor-to-ceiling patio doors onto a large, wooden roof-top deck. Ward 30 Councillor, Paula Fletcher introduced the meeting by putting the study into context for everyone. She noted that this study is one of five area planning studies being undertaken right now by City Planners at her bidding – as Leslieville and South Riverdale and Riverside are experiencing a tremendous growth in the rate of development. An over-view of the planning process and the history of recent planning in the area was then outlined by City of Toronto Planner, Heather Baron – who then set us to work at our facilitated working group sessions at five tables spaced around the large room. Each table had 8 to 10 citizens along with a representative from one of the various City departments involved in the study – working as facilitators. Over 45 minutes we went through a list of items prepared by the organizers related to Councillor Fletchers’ motion at Toronto and East York Community Council, and our opinions about Public Amenities in the study area. The categories listed on the big discussion papers that organizers had placed on each table (along with a selection of maps, artists’ street-scape renderings, and other documents from Planning) were so broad that they simply acted as a starting point for what people already had on their minds – but also worked as a guide so that we were all addressing basically the same issues. I noted right away there was no mention of bicycles, bike lanes, bike parking or cycling as a transportation choice, anywhere in the documents or the introduction. After the facilitated round-table discussions – someone from each table presented their groups’ notes to the entire meeting. All five tables noted cycling issues in the study area. Cycling it seems, is an essential element in a discussion of quality of life in public spaces. I was shocked – by the time the fifth table began reporting I was waiting for the cycling mention like one anticipates a hit late in a ball game. Then, Wham-o! Table five talked more than any other about cycling issues! The times they are-a-changing. It appears that there are a lot of people in the neighbourhood who are using their bikes on a very regular basis. The bike – and the amenities one needs to use a bicycle as a primary transportation mode – are apparently integral to this evolving neighbourhoods’ life-style choice. As a ward group representative for Cycle Toronto’s “Ward 30 Bikes” at these meetings – I’ll represent this point of view as this public consolation process continues, with another Public Consultation meeting scheduled for January. N.B. The acoustics in that room made it very hard for some people to hear. Two other people mentioned it during the meeting. I, for example have frequency hearing loss in one ear that has the effect of turning reflecting acoustic waves into white noise. I had to step out of the room for most of the five-table facilitation process because the voices of all the people talking all at once bounced around for me, like light does in a house of mirrors. Next Post Jog-Downs at Temporary Entrances off Lake Shore into the Big Box Stores at Leslie Street are too Abrupt – Blinding Cyclists to approaching, turning cars.